AIR JORDAN FLIGHT FRESH PREMIUM. The shoes are in very good used condition. Good Luck! Size is a US Boys Youth 2Y. Breathable and made for motion, these Jordans have a one-piece textile upper that locks in comfort and provides ventilation. Style and comfort are on the horizon with the Boys' Preschool Jordan Horizon Basketball Shoes. Kids low top lifestyle sneaker. COLORS ARE AS FOLLOW: VARSITY RED WHITE TOUR YELLOW! Foam midsole with visible Air unit. SIZE 6.5 Y.
Jordan 6 Retro BP Youth Size 1y Maroon. Condition is New with box. Shipped with USPS Priority Mail. Youth Boys Nike Air Jordan 5 Retro BP Shoes. Good Condition! Condition is Pre-owned. red jordans size 7 Jordan son of low. Condition is New with box. Shipped with USPS Priority Mail. Item: Nike Air Jordan 10 Retro (gs) - Size 2Y - 487211 605 - fusion red/black-laser orange. Color/Size: fusion red/black-laser orange / 2Y. Product Number/Model: Air Jordan 10 Retro (gs). Condition: This item is pre-owned and in good condition. Insoles: Good. Upper: Has staining. The exterior has light minimal wear, soles are a bit dirty. Do not miss the opportunity to own this great pair of shoes! Air Jordan Candy Cain Cherry14 XIV Size 6.5 Amazing Condition. 2011 Air Jordan 14 XIV Cherry’s. I do not deal in fake shoes. will possibly add money for a nicer pair. NIKE AIR JORDAN LOT Of 10 Pair For Children! 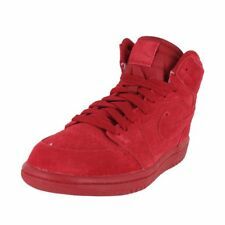 Jordan Size 1.5Y Red. Condition is Pre-owned. Shipped with USPS Priority Mail. Here are some black,red, an white Jordan's. Shipped with USPS Priority Mail. The shoes are youth size 3Y and have tons of wear remaining. Model: Jordan 1 Retro. Year of Release: 2017. Colorway: Red. Shoes are in excellent condition. Very little wear on soles. Discoloration from washing. Lots of life left for your little one!! What you see is what you will get. Jordan Size 12 Youth Tennis Shoes. Condition is Pre-owned. Shipped with USPS Priority Mail. Air Jordan 13 Retro 'Bred' 2017 The Air Jordan Youth size 6 Condition is New with box. Air Jordan 13 Retro 'Bred' 2017. Youth Size 7Y. Nike Air Jordan 1 Retro High OG GS Sports Illustrated Shoes. 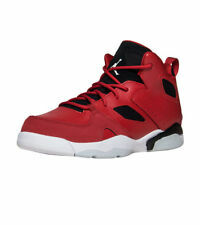 Jordan Flight Luxe Bg Red Size 7. Condition is New with box. Shipped with USPS Priority Mail. Good Condition. What you see is what we send. Make sure you have no financial issues before purchasing. Unique, Creative, Well Searched, and Prized possessions. Very Good Used Condition (see photos). BRAND NEW WITH BOX. -I take the photos myself to give you the best possible description of the item you are going to receive. -SEND THE SAME DAY. SERIOUS AND HONEST SELLER. ALL MY FOOTWEAR IS 100% NIKE AUTHENTIC. - GUARANTEED DELIVERY OF 2 TO 3 DAYS, BY USPS PRIORITY MAIL (USA) - INTERNATIONAL DELIVERY TAKES 5 TO 10 DAYS. BOYS Red JORDANS Size 5.5. Condition is Pre-owned. Shipped with USPS Priority Mail. We will describe the item to the best of our ability. We do not know the history of the item or have personal use of it. P lease see photos for more details. This Air Jordan Retro 1 sits atop a white colored sole. Air Jordan Retro 1 sits atop a white colored sole. Children's mid top shoe. Size 2 youth. Lace up closure. Nike Air Jordan Retro 11 XI "Gym Red" 378039-623 Size 3Y Youth "Win Like 96"
Nike Air Jordan Retro 11 XI "Gym Red" 378039-623 Size 3Y Youth "Win Like 96" Shipped with USPS Priority Mail. 100% Authentic guaranteed. Jordan 11 Gym Red, Size 5.5y “BIG KIDS”, Never Worn, **Perfect Condition**. Condition is New with box. Shipped with USPS Priority Mail. jordan youth size 6. Condition is New with defects. Shipped with USPS Priority Mail. This for a pre-owned youth Air Jordan 5 Retro (Fire Red 2006). Colorway: White / Fire Red-Black. Air Jordan Retro 12 (Bordeaux). Condition is New with box. Shipped with USPS Priority Mail. JORDAN RETRO 5s FIRE RED!!!!! WELCOME TO MY ACTION. TODAY WE HAVE A PAIR OF JORDAN 5s FIRE RED UP FOR GRABS. THIS SHOES ARE IN GREAT CONDITION. THERE ARE A LITTLE SCUFFLES ON THE SIDE SHOWN IN PICTURES ABOVE. THESE SHOES ARE A SIZE 5.5y. Style # : 822858-032. - You MUST send the item back with the original box. Colorway : River Rock/ Black. We will get back to you as soon as I can. VERY GENTLY used Air Jordan "David Letterman" 1's. Grade school size 6. Original Nike box included along with extra laces. Sneakers have only been worn twice. Kept stuffed to maintain new like shape.